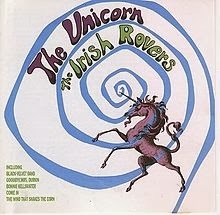 "The Unicorn" was selected because Monday is St. Patrick's Day. Unfamiliar with this week's song? Hear it here. 1) This song was recorded by The Irish Rovers. While it's said that on St. Patrick's Day everyone is Irish, can you honestly claim Irish heritage? 3) Other than St. Patrick, what is Ireland famous for? 4) St. Patrick's Day is celebrated the world over. They even watch marching bands and wave Irish flags on St. Patrick's Day in Moscow. Does your town have a St. Patrick's Day parade? 5) "The wearing o' the green" is one way to celebrate St. Patrick's Day. Will you wear something green in honor of the day? 6) Have you ever had green beer? 7) Have you ever ordered a Shamrock Shake at McDonald's? 8) A four-leaf clover is considered good luck. Do you have a lucky charm? 9) Speaking of Lucky Charms, they are magically delicious. What brand of cereal is in your kitchen right now? I'm sorry, by midnight I'll be fast asleep. Thank you Sam for doing all you do to keep this fun meme going! Love it!